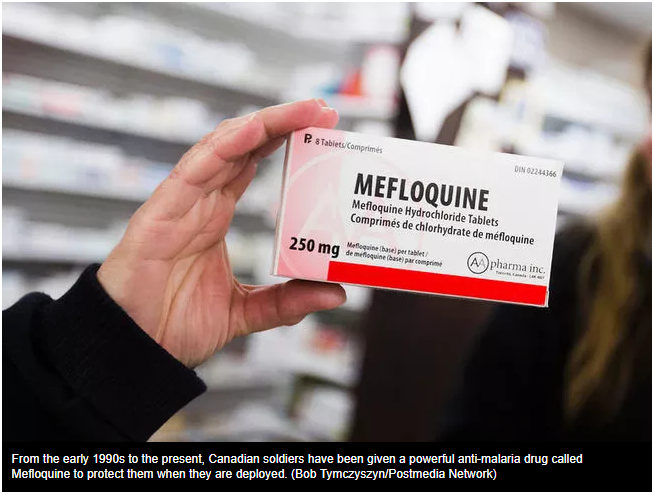 Many veterans who were forced to take the drug before it was licensed still suffer from side effects that Health Canada and AA Pharma, the Canadian supplier of the drug, quietly added to Mefloquine’s warning label last year. “We must do more to reach out to these veterans, to acknowledge the harms that Mefloquine has caused them, and commit to funding research to study and ultimately try to reverse these effects,” Matchee writes. Dr. Remington Nevin, of Johns Hopkins University, says Mefloquine toxicity can cause brain damage that mimics PTSD, so sufferers may receive the wrong treatment and symptoms such as suicidal thoughts persist. The National Defence Department recently revealed 441 male service members committed suicide from 1995 to 2014. Those numbers don’t include veterans. So it’s unclear how many former soldiers like Lionel Desmond, who killed his wife, daughter, mom and himself on Jan. 3, have committed suicide. Conservative MP Cathay Wagantall, a member of the Standing Committee on Veterans Affairs that has urged Health Canada to review Mefloquine, said it’s frustrating our military has yet to follow the lead of our many allies and either ban the anti-malarial or list it as a drug of last resort. “With all the evidence now available, they’re choosing to pretend it’s not happening,” she said. The Department of National Defence currently has no plan to contact current or former soldiers and ask if they are suffering any known side effects of Mefloquine. “There is a Surgeon General’s review ongoing and the results are expected at the end of March,” the DND reported. Veterans Affairs encourages any former soldiers who need help to call 1-866-522-2122 or our visit www.veterans.gc.ca. “The health and well-being of veterans is a top priority for the government of Canada and we are committed to providing Veterans with the support that they need, when they need it,” Veterans Affairs said. – March 16, 1993: Canadian Airborne Regiment Master Cpl. Clayton Matchee and Pte. Kyle Brown tortured and killed Somali prisoner, Shidane Arone, 16. Brown was imprisoned 40 months and now reportedly suffers from PTSD. Matchee suffered brain damage in a failed suicide effort and was deemed unfit to stand trial. – Dec. 25, 1994: Canadian Airborne Regiment Cpl. Scott Smith told a reporter Mefloquine caused him to hallucinate while in Somalia, then two months later he killed himself on Christmas Day in Rwanda. – 2000: Now retired lieutenant-general Romeo Dallaire, who has admitted Mefloquine affected his ability to function in Rwanda in 1994, attempted suicide with alcohol and pills. – March 12, 2015: Decorated veteran Joseph Woods, 42, a special forces soldier who served in Croatia and Somalia where all troops were given Mefloquine, hanged himself while in Maplehurst prison and died two days later. – Jan. 3, 2017: Decorated veteran Lionel Desmond, 33, of the Royal Canadian Regiment, was suffering from PTSD after serving in Afghanistan when he shot his wife, their 10-year-old daughter and his mom in Nova Scotia.